During the 4th century, Volterra was 1 of 12 members of the Etruscan League cities. From the 5th to the 12th century, the Bishop of Volterra ruled. Eventually, Florence conquered the town with a very bloody invasion. 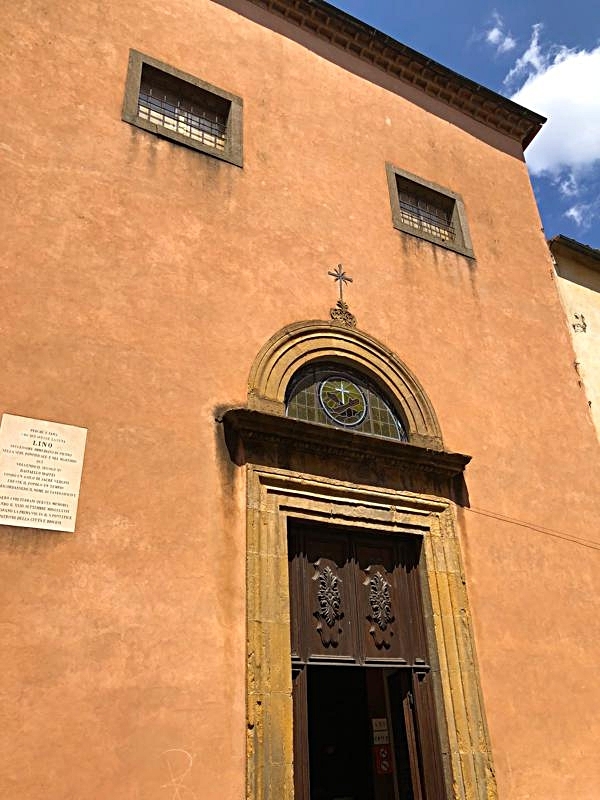 As you walk around the town, notice the many stone plaques and columns with two lions; these were a result of the Florentine conquest of the city. In 1530, the Florentine rule ended. The Medici took over and create the Grand Duchy of Tuscany. Finally, in 1860, Volterra became a part of unified Italy with the end of the Republic. In recent years, the town grew in popularity as it was featured in Stephanie Meyer’s vampire series, Twilight, as the home of the Volturi (the ancient vampires). Montepulciano (instead of Volterra), however, was the town filmed for the movie. Walking through this town is truly stepping back in time. The narrow, cobblestone streets wind through the medieval buildings. Each turn brings a new discovery from a different historical time period. We started our journey in Piazza dei Priori. 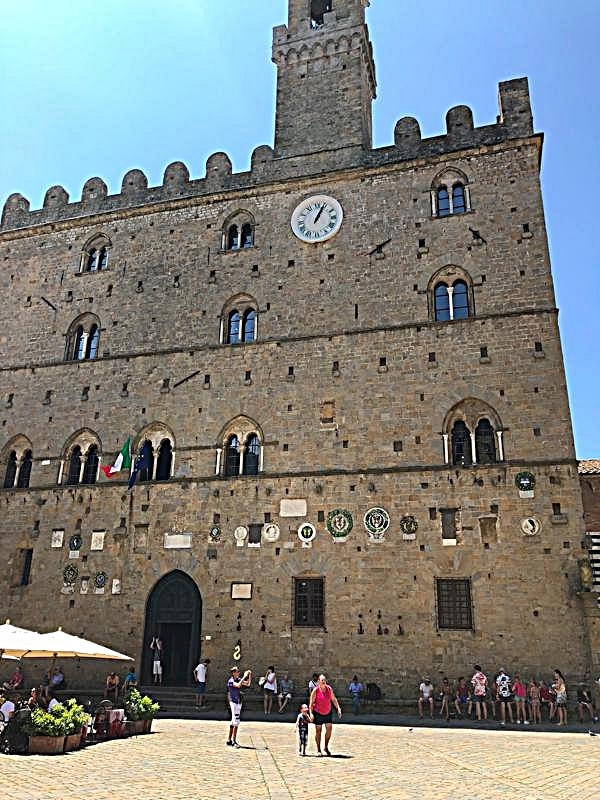 The main building, the Palazzo dei Priori, serves as the town hall or seat of the mayor. Built in 1208-1257, this is the oldest town hall in Italy. The outside of the building is decorated with symbols of marble and pottery. Volterra is known for their alabaster. Also in this square is the Palazzo Pretorio which features one ancient tower known as “The Tower of the Pig” since there is a stone pig placed on it! Standing in this square you are transported back to the middle ages. Its magical! While wandering the medieval streets, I stumbled upon one of the most incredible spots- an artist's studio. This open aired studio allowed visitors to watch the artist in action- carving sculpture out of alabaster. This ancient tradition dates back to the Etruscans who used the stone to create capitals, vases, and other artifacts. The city is surrounded by large, natural deposits of alabaster. Working with Alabaster is an art form whose secrets have been passed down generation to generation in Volterra. Objects made of this gorgeous stone can be found throughout stores in Volterra. But I was entranced by this artist studio- fantastic! From here, we wandered down a steep, narrow, pedestrian street which ended in one of the six Etruscan gates to the city, the Porta dell’ Arco. This gate served as the southern entrance to the city. It is the only remaining part of the ancient 4th century walls. It was incorporated into the city walls that were built in the 13th century. The gate and the view of the countryside through it are incredible. Various types of stone were used to create this arched gateway. Looking at the gate from outside the wall, three stones portraying three human heads guard the gate. It is believed they represent the guardians of Volterra- Jove, Juno and Minerva (from Greek/Roman Mythology). During WWII, around June 30, 1944, the people of Volterra saved the gateway from being blown up by the Germans (who wanted it destroyed so the Allies couldn’t enter easily). The Italians used stones from the pavement surrounding the gate to seal up the entrance saving this ancient monument from destruction! Our next stop sat on a street above the Porta dell’ Arco. We entered a small square directly in front of the Duomo (which was closed for renovation during our visit) The Baptistry of San Giovanni, however, was open. This octagon-shaped building sits directly opposite the Duomo. Baptistries were a separate building created to hold the baptismal font where the rite of Baptism occurred. Most were octagonal representing the 8th day of the week or day of recreation (from the Bible). Fonts were made of a marble basin. The 13th century Volterra Baptistry is a stunning example. It is unique from other Tuscan Baptistries in that only one side is decorated with green and white striped marble (like the marble of the Duomo in Florence). 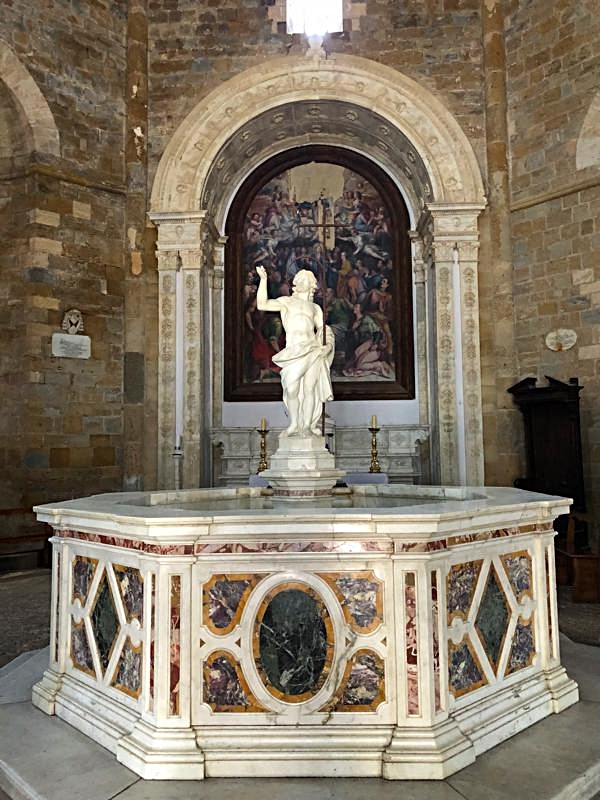 A statue of St. John the Baptist (by Giovnni Antonio Cybei) towers over the font which was created by Giovanni Vacca in 1759. Behind the font, a stunning altarpiece with a 16th century painting depicting Christ’s Ascension by Niccolo Circignani hangs. Damage to the upper central portion still remains from WWII. The inside of the Baptistry is truly incredible! After visiting the Baptistry, we continued to wander the medieval streets. Volterra is very, very hilly! On our walk toward the western gate, we stumbled upon one of my most favorite churches that I have visited in Italy, The Church of St. Lino. This church is small but held a very magical atmosphere for me! It is believed that the church is built on the site of the birthplace of St. Lino, the 2nd Pope. Not much is known about St. Lino. The church and adjacent convent were built in 1480; today the convent is a hotel. From the outside the church is a very simple, small building but the inside is packed with incredible art. Frescos depicting story of the Life of Christ by Cosimo Daddi (created around 1618) adorn the ceiling. I was blown away by these frescos. The Church of St. Lino had a peaceful, spiritual quality I had not experienced in any other church. From the Church of St. Lino, we continued exploring until we reached the north walls of the town. These Etruscan walls date from the 4th century B.C. The view below the wall on this side is equally as amazing as the south side but very different. An incredible Roman amphitheater built in the 1st century BCE with bleachers and columns is still standing. Just beyond the amphitheater sits the ruins of Roman baths and a Roman forum dating to the 4th century. Any archaeology lover will be thrilled. It’s hard to believe but this archaeologic treasure was actually used as a garbage dump during the middle ages! Countless other churches and museum stand in Volterra. We loved wandering through the town exploring, eating and shopping. Having visited many of the other Italian hill towns, I was wowed by Volterra. One other nice thing- unlike some of hill towns more popular with tourists- Volterra wasn’t over run with visitors. This old town is a wonderful day trip for any lover of art, history, and architecture. Volterra found a place in my heart!